“My work, on one level, allows me to share a part of who I am — an artist with a profound desire to share my artistic creativity with others. On a more definitive level, my work allows me to share the timeless beauty of the feminine figure. The inspiration for the creation of my Ladies Series is the beautiful flowing lines of the calla lily flower. In 1991, a vision appeared to me of a faceless beauty emerging from such a flower in my garden. It was one of those moments when I knew deep inside of myself that my work was ready for a metamorphosis. Indeed, my contemporary southwestern art almost immediately transformed into contemporary women in relationship to that flower. My semi-abstract creations remain faceless, thus allowing the beholder to use their imagination in the connection with each image. Diversity, in the form of unlimited images created using a number of different materials and processes, gives me the most enjoyment. I am constantly searching for and experimenting with new ways to present my art. For my Glass Collage, I employ a unique technique putting metal and sandblasted water glass together to produce a three-dimensional work of art with a fascinating "wave" effect. For my Metal Collage, I employ a unique technique of using sheets of metal and metallic acrylic paint to produce a three-dimensional work with a dazzling sheen and luminescence. The mediums for my freestanding sculpture include Bronze cast through the “lost wax process” and a Bronze Dust through a “cold cast” process using a durable yet lightweight composite material that I developed. The medium for my “bas relief” Wall Sculpture is a composite resin material to which I apply several layers of metallic acrylic and silk paper for the gown. I complete each piece with my trademark — one sparkling earring adorning each lady — representing her inner light. 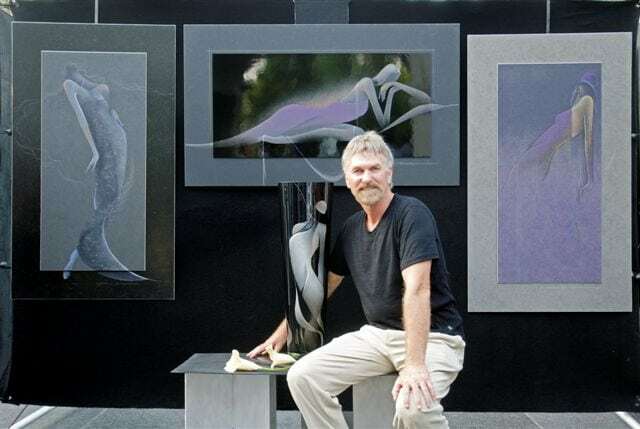 Since 1992 I have exhibited my work at numerous private art shows and indoor and outdoor art festivals throughout the country, in cities such as New York (Art Expo), Chicago, Scottsdale, Vail, La Jolla, La Quinta and San Francisco. Valentine’s artwork is a collection of subdued yet striking “Female Figuratives.” When you gaze upon a Valentine masterpiece, you may first notice the fluid lines and the long yet graceful stem of a familiar flower. But upon closer examination you may begin to focus on a faceless beauty with a fantastic heart-shaped hat or flowing hair emerging from a lovely calla lily. Indeed, Valentine’s semi-abstract sculptures and paintings resonate with the female essence while capturing the “soul” of the calla lily flower. What could bring the artistic mind to the crossroads of a single flower and one quintessential lady? The answer must be Valentine’s lifelong passions – nature, physical essence and music. Born in May 1951 in Oxford, Michigan, Valentine immersed himself as a child in the fields and ponds that surrounded his country home situated on the edge of town. “My fondest early memories are of exploring the seemingly endless sea of grasses, wildflowers and cattails that waved in the breezes. I chased frogs and rabbits until sunset on a farm-like expanse of Midwestern land. I even raised exotic pheasants for a period of time! And while I never thought of myself as an artist while growing up, by first grade I was one of those kids who could draw anything I saw.” As a youngster, however, Valentine found sports a more socially acceptable outlet than formal study of the arts or of nature. By the eleventh grade he had distinguished himself in football, basketball and track like his brother and father before him. Not surprisingly, Valentine obtained his BS degree from Central Michigan University with a major in Art and a minor in Physical Education. Valentine’s artistic career took a back seat to teaching art and coaching sports at positions he held in New Mexico: one year at the Jicarillo Apache Indian Reservation, two years at the Santa Fe Preparatory School and four years at the New Mexico School for the Deaf in Santa Fe. But serendipitously, while teaching at the School for the Deaf, he lived just blocks from the Plaza in Santa Fe, where 150 of the finest art galleries enjoyed an international clientele. When his creative spirit led him to produce hand painted Christmas cards in 1983, he asked one of Santa Fe’s top framers to enhance his creations. She fell in love with his cards and then assisted him in getting his work shown at numerous galleries in the area. The rest is history. His professional career was officially launched with his first one-man show at the prestigious El Taller Gallery on Valentine’s Day, February 14, 1984. While Valentine appreciates the quieter moments in life, music of all kinds has always been an integral part of his creative process. Without exception, he listens to music as he paints or sculpts his beauties. Nothing is more evident of music’s G clef than the flowing lines of hair on each image, which remind us of the rhythms of a song. Valentine’s work is created using his natural creative ability and from his imagination. Symbolically, he merges his passions – the flowers of nature, the essence of physical life and the sounds of music – into exquisite masterpieces, reminding us of the mysterious feminine beauty that surrounds us all. And, finally, we are captivated by his final touch, the earring adorning each lady, representing her spiritual inner light. Universal and timeless, graceful and elegant, Valentine’s Female Figuratives capture our souls forever.